首页 » 乱七八糟 » Hello ClearClick, Goodbye Clickjacking! As you already know if you read my first clickjacking article, an old and benign clickjacking example is NoScript’s “Install Now” orange button, which overlays the green one on addons.mozilla.org to work-around the installation security warning. 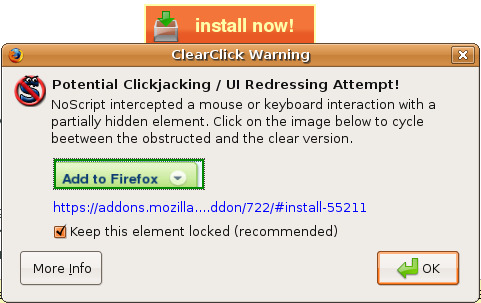 If you click it with ClearClick enabled, now you get warned about something sneaky going on. I do not need to change my button yet, because NoScript 1.8.2.1 ships with ClearClick enabled on untrusted (non whitelisted) parent pages only, while the whitelist status of the embedding is irrelevant. This gives a good balance between effectiveness and usability, since the attacker in a clickjacking attack is always the parent. If you want to get the warning on noscript.net and on the other sites you trust, you need to flag the second checkbox on NoScript Options|Plugins|ClearClick protection on pages… [x] untrusted [x] trusted. I recommend to flag it anyway and report any usability issue, because this feature so far seems quiet and unobtrusive enough to justify my temptation of enabling everywhere (trusted + untrusted) by default on next stable release, but it must get a lot of testing from you first. Opaque embedded objects: plugin content and frames are forcibly made opaque and get styled with “overflow: auto” (i.e. get scrollbars if their inner size exceed their viewport) on untrusted pages.